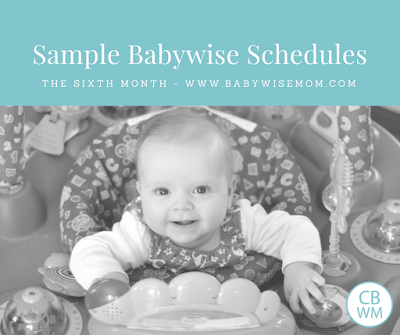 Babywise sample schedules for 0-12 month olds. Over 100 baby sleep schedules and routines to help your baby eat well, take great naps, and sleep through the night. 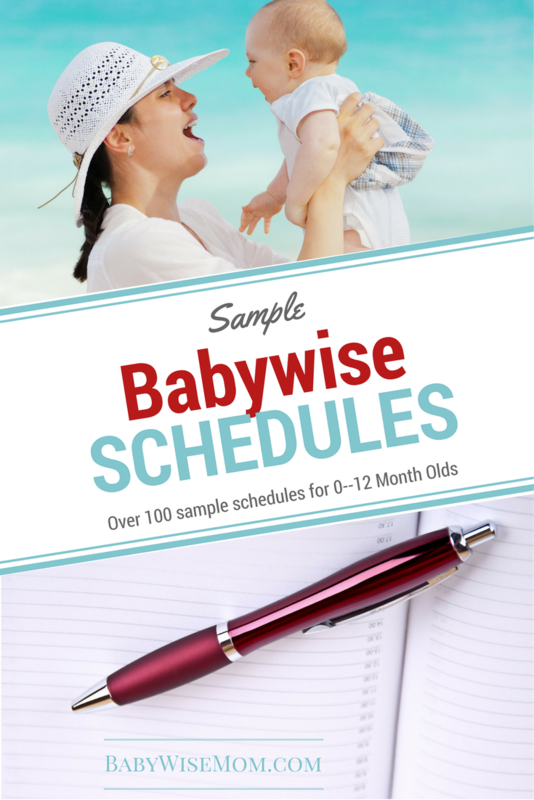 You have read On Becoming Babywise and are ready to get a great schedule. You want a sleep routine and schedule and to get consistent days. 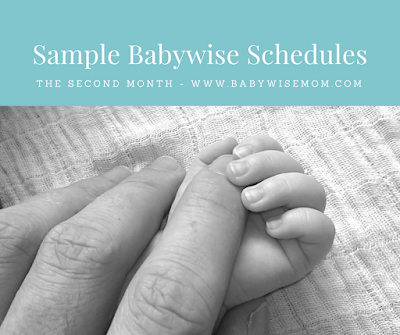 You are probably wondering what a sample Babywise schedule might look like for the age of your baby. 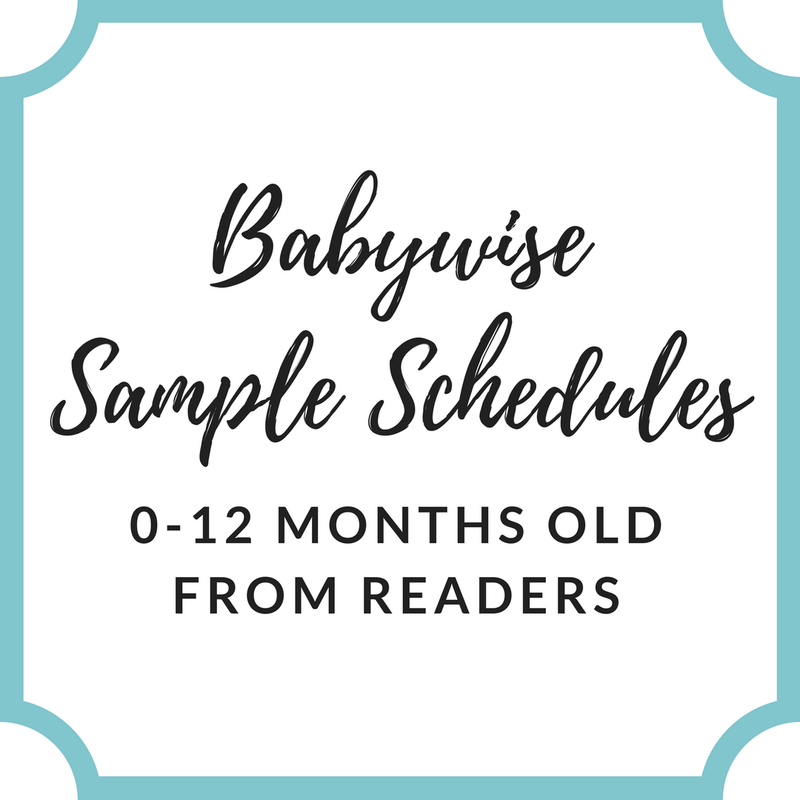 In this post, I have compiled sample Babywise schedules readers have shared over the years. 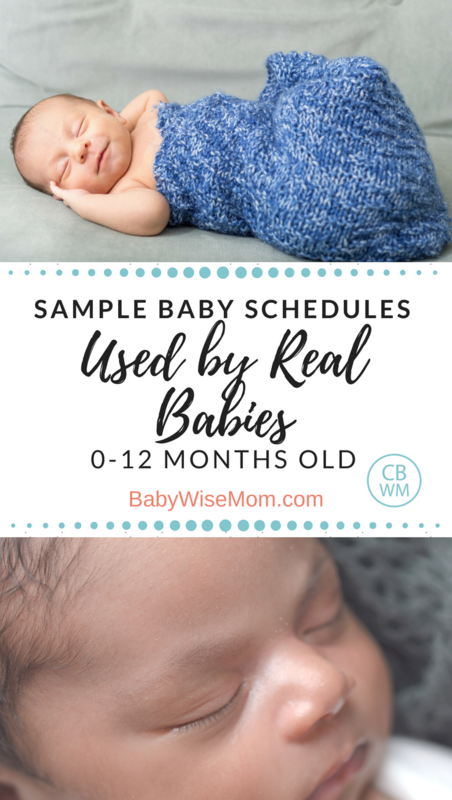 Knowing what schedules other babies have used can be very helpful when trying to decide what is normal and what is not normal for your baby. Notice that there are many variances in these schedules. All babies are different and have different sleep needs. To use this post, scroll to find the age of your baby. Get your copy of On Becoming Babywise (affiliate) here. Bottles are all BM. Amount varies from 3 – 6 oz per feeding. Initially, I was concerned by the variability in how much he eats per feeding, but then I realized that this could be happening if I were nursing him (as I did with my first son) and I’d never know that was the case. Naptimes are approximate — I am still working on trying to figure out the optimal waketime for him for each nap. We have used this schedule from 6 weeks til now at 4 months. It’s working so we are not changing it! Although we did switch the 10 o clock feed to the after bath feed around 12 weeks. 7:00 – 7:30am wake time, Feed (5 ounces) & dressed for day care (I try to let her wake herself up but won’t let her sleep past 7:30). 5:30 Pick her up from Day care, arrive home, greet Daddy when he arrives, say hello to puppy dogs then relax in cradle swing. 7:00 feed (6 ounces) followed by snuggle time or play time depending on her mood. STTN 11 hours since 11 weeks. Wake to feed through night but aiming for 3am!Although LO is not napping at the moment! Just lies awake – am hoping this will pass soon!! 3 AM- wakes up and eats 6 oz. This isn’t “scheduled,” but he is waking up at the same time every night for this last bottle.We’re still working on our schedule. Especially naps. Sometimes he just won’t go down, and CIO isn’t an option. 6:00 Wake/nurse/diaper change/wake time7:00 Nap9:00 Nurse/diaper change/wake time10:00 Nap11:30 Nurse/diaper change/wake time12:30 Nap2:00 Nurse/diaper change/wake time3:00 Nap4:30 Nurse/diaper change/wake time5:30 Nap7:00 Nurse/diaper change/bedtime routine8:00 Down for bed10:00 Dreamfeed/diaper changeMiddle of the night – will usually wake up at 2-3:30amTotal wake times 50-75 minutes per cycle. We put her down for a nap when she starts to show signs of being tired (yawning, not engaging with us or toys, bringing hands to month/eyes). I have them on the same schedule. Sometimes one isn’t as hungry or tired yet, but whoever is “dominating” wins, and they both get the bottle or bed time. Otherwise, I don’t think I could survive! approximately 4am middle of the night feeding. Going to start reducing ounces and try to drop this feeding soon. God bless you all for sharing! And Val if i am missing something, or doing something wrong please feel free to give me some suggestions so i can achieve the 10-12 hours of sleep, thank you!! Here is my current schedule for my 9 week old girl. (She was a premie so her adjusted age would be closer to 5 weeks.) She is a good sleeper and started STTN at 7 weeks. We never did a dream feed because she goes to bed later than most. 6am: wake and nurse and she goes right back down. 9am: wake and nurse and play time. 12pm: wake and nurse and wake time. 6pm: wake and nurse. She will sit in her bouncy seat while family eats and then we all go for a walk together. Sometimes she sleeps and other times she stays awake the whole time. 8pm: She is awake by this time if she even took a nap after 6. We start our bedtime routine of bath and 4 oz bottle of either formula or pumped BM. 9pm: Bed! She sleeps through until 6am. Then usually wakes around 3:00am to eat. 9 month old schedule is the same as 8 month except we’ve added meats into the dinner time feeding. 9:15 bed, sleeps through the nightI find that her nap routine is the least consistent since I work part-time and different family members keep her on those days. Her bedtime, morning waketime, and feeding time is very consistent. I would like for her naptimes and activity times to be more consistent. After charting everything for several days as suggested by the Baby Whisperer, her naptimes really depend on who keeps her that day. We dropped the dreamfeed 2 weeks ago and he’s slept through the night ever since (would love to have a morning waketime of 7-8am, but maybe in a few weeks?). We’re also thinking about dropping the last nap to get him to sleep longer in the morning, but we haven’t quite figured that out without dropping a feeding. I’m exclusively breastfeeding so I pump around 9:30 to keep my supply up and I have extra bm in the freezer in case I need it! Usually wakes between 6:30 and 7:00am, but stays in crib until close to 7:00. He’s EBF, no solids. 7:00p family walk, out to dinner, church bible study, usually doing something during this awake time. Bed by 8:15At nearly 6 months old, his waketimes are still 90 minutes and he still needs 4 naps. Most of the time his nighttime sleep is only 9 hours and I would like to move to 10 hours, but so far that hasn’t happened. My sister nannies for us, so the activities vary, but this is the report I usually get when I call home while pumping. Naps and meals are very regular. 4:20 play in playroom, practice sitting – 5:30 daddy comes home and we either all go for a run or Daddy takes them while I stay home to pump, do laundry, wash bottles and have some “me” time. 10pm I pump and then wake up again at 3am to pump. I’m really trying to keep up with them as much as I can. we have also been playing with the four hour schedule. The above schedule is if I manipulate it. Sometimes they go a little over. Tonight we gave them a bottle at 4:15, then green beans at 6 then a four oz. bottle at 6:30 then Bed. 5/5:30 – occasional catnap for 15-30 min. I moved the naps back a little because she just doesn’t seem tired after only 2 – 2 1/2 hours of wake time. But even now, she is playing in her crib for 30 minutes before falling asleep at the beginning of each nap. I am having to wake her to eat lunch and dinner, but I don’t think I should push her naps back anymore…I mean she is already going 4 1/2 to 5 hours between meals during the day. Do you have any suggestions for other adjustments I should make? Thanks! And thanks for all the schedules; it really helps to see what other families are doing! 6:15pm: bathtime & quiet time activity (I have a two-year old as well, which is why this time begins so early). She has quite bad nightmares so her ‘nap time’ is disturbed sometimes with this. 9-nap(2hours on a good day) Always on the go with the 3 year old/running errands in morning so not always at times only a 45 minute nap. 3-wake/nurse/snack (usually sits in bumbo while sister has art time. 4:30-sometimes has a cat nap depending on how the morning nap went. If not then just plays with sister on the floor. 9 month old boy: Currently, we are in the process of dropping the 3rd nap, as well as adding minutes to Independent playtime. Yooli said…10 month old boy – on a 4.5 hour schedule (same schedule since 8.5 months). Has been reducing his bottle ounces recently – went from 24oz at 6 months to about 12-16oz per day since 9.5 months. We offer a sippy of milk or water all day if he’s thirsty and might get another ounce or two that way. Not a big eater overall. Has access to a snack trap in his playroom – seems to be happier about eating on the go which I don’t like but am allowing the playroom Cheerios while he is learning how to feed himself. Wake, 4-6oz bottle, and solids at noon. Wake, 4-6oz bottle, and solids at 430pm. (If he eats well at this meal it’s dinner and he sits with us at gets a snack at 6pm-ish when we eat dinner. If not, 430pm meal becomes the snack and we try to feed him again at our dinner time). Sit with us at dinner at 6pm and has puffs or other finger foods. 9am – 20-30mins of independent play in cot while mum gets dressed! 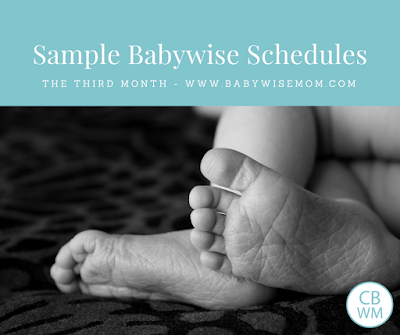 The Chronicles of a Babywise Mom Facebook Group is another great resource for schedule ideas! 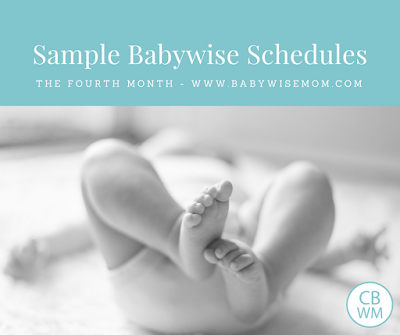 Comment on this post to add your individual children’s sample schedules. Please include the age for the sample schedule. As you comment, I will organize the sample schedules into the main body of this post. Add them for any age; you don’t have to do all of them. 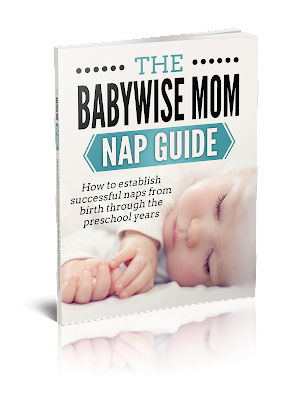 If you need help getting your baby sleeping better, get my eBook The Babywise Mom Nap Guide. This comprehensive guide will help you get your baby to take great naps. Hey Monica! About your question…it just depends on the day and how his naps have been. If he has had a couple really long naps (2-3 hours) during the day then he usually does fine with just that catnap, but if hes been having 1 to 1/2 hour naps all day then we will put him in his crib after his 5:30 feeding and see if he'll nap awhile. Most times he does. I've been wondering if we should put him down a little earlier like 8:00 so we've been slowly trying to ease into that. Last week we started to give him his last bottle at 8:45, this week we'll give him his last bottle at 8:30, etc. I just want to make sure he's still sleeping til his desired wake time of 8 am. So far he has been. Maybe your little guy is ready for an earlier bedtime too. Gibson's fussy time is around 8 and we feel like maybe he's ready for bed by then. Try putting him down in the early evening and see if he'll sleep for a real nap not just a catnap, and start easing into an earlier bedtime and see if that helps… 🙂 Let us know how it goes. Danielle, if it were me, I would not worry about the baby's mealtimes coinciding with family mealtimes yet. We start the day at 6am and I think my baby's meals won't coincide with ours until he's closer to a year old and has longer waketimes. It just won't work out with his waketimes and length of naps. 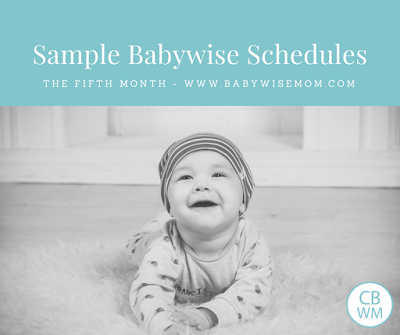 I think Babywise or Babywise II says that it is a goal to get mealtimes to align by the end of the first year, but if he's 7 months you still have plenty of time to get there. Thank you everyone for adding your schedules! I have added them to the main body of the post and will be deleting your comments that have your sample schedules in them.Readers are still welcome to add sample schedules! Danielle, I agree with D&H. I wouldn't worry about meals coinciding right now. You have an extenuation circumstance. I actually don't really have them coincide until the baby is about 1. No need to rush it. *****Help me ************Hi I have a real big problem. My 10 mo old DD isn't nursing anymore, she pushes me away or bites. I try and use a sippy cup/ staw/ medicine spoon/ and a bottle and she bites those too and doesn't drink much, throws them or pushes them away. Only drinks maybe 2 oz. I called my pedi. and he said just to keep trying if she's not wanting to nurse and my milk supply goes down to start trying formula. I'm so emotional about this because we're so close to the 12 month mark. And it took me so long to Bfeed her without any problems. She wont take ANY milk, formula, my milk and the dr told me NO cows milk. what do I do? Help me PLEASE! Plus she's been very fussy, she might be teething becuase her second nap has been a hit or miss with crying and if she does go down it varies 45 min- 2 hrs. Should I try and pump every 4 hrs? I only get maybe 2 oz at most when I do pump at night so I dont go more than 10 hrs without pumping/feeding. What do I do if she won't drink any milk? Tom, if she won't nurse and you want to try to shoot for 12 months, I would pump at least every four hours. Maybe three unless you have a strong electric pump.So far as her nutrients, she won't let herself starve. I know it is distressing, but if she is healthy, then she will nurse when she needs it or she will take other liquid offered. But I would also consider possibilities like an ear infection or something else that might be affecting appetite and causing poor naps. Teeth can also do that. Thank you D&H! You are awesome for continually adding. Thank you so much for your blog! I've just discovered it and love it!My baby boy is 3 months old now, and I've read in babywise he can start going to four hours for feedings. It looks like most people that posted schedules for around his age are still on a 3 hour schedule. Should I go back down to 3?He wakes at 9- eats Sleeps at 1130 or soWakes at 1 (He's still transitioning to 3 naps a day so he usually wakes up at 12 or so and I'll give him his binkie after 10min to go back to sleep)Goes to sleep at 230Eats at 4Naps at 6Eats at 8 then bed time routine and he's a sleep by 930.Also, what are your thoughts on the binkie?Thanks!! Aly, if four hours is working for him, then that is no problem. You can stick with it. The binkie–I have no personal experience, but if you click on the "pacifier" blog label, then you will see a link to a great post with good guidelines for using it wisely. So glad to have found your blog! I've read it soo many times in the middle of the night while feeding/rocking my LO. Thank you!I have a couple questions about scheduling. My LO is 7 weeks old and I have had him on a 3-hour schedule since he was about 3 weeks old. We do CIO during the day (after I sing and rock to him – usually he's awake/drowsy when I put him in bed), and he has been doing okay with that, although lately he has been digressing a bit. He'll be calm for about 10 minutes, then start wailing. Is this normal after he's been doing CIO since week three?He is not a good napper — the most I can usually get is 1.5 hours, if that. I've read all your posts about waking early from naps, and I can't think of anything that could be causing this except that he's just not tired. However, if I pick him up and hold him for a while, he will eventually fall back asleep… which is frustrating and makes me think he IS tired! Should I let him CIO for longer than 10-15 minutes when he wakes early? He will occasionally fall back asleep after he's cried for a while, but it's rare and his sleep doesn't last long. Could it be that he's just like your son and hates to sleep?Also, we are having absolutely no success with sleeping through the night. He usually goes to bed around 9, dreamfeeds anywhere from 10:30-11, and will inevitably be up by 2 or 3. And a lot of times he's wide awake at that point. I realize a lot of BW babies don't sleep through the night till they are 12 weeks, but we can't even get him to go for a longer stretch. And he is consistently waking up at 5:30 and 6:30, even though our day doesn't start till 7-7:30. I try to put him back to bed, but don't always have success with that. He does have a TON of tummy issues, but there's not a whole lot you can do about those! Should I expect him to sleep longer than 4 hours at this point? I am feeling frustrated and worn out, even though I think I'm being pretty consistent with his scheduling.Sorry for the long post. Hope I'm not being redundant. I appreciate your help!! One other thing… when he wakes up at 5:30 and 6:30, he is usually crying and sounds very upset, even he's full. I usually have to rock him back to sleep or give him his paci. Just not sure why this would be…Also, I did notice your comment about weight. He was 6.8 at birth and is probably about 10 pounds right now. Does that mean I should probably expect less from him? I'm excited we found this website but there is A LOT of info to sort through! 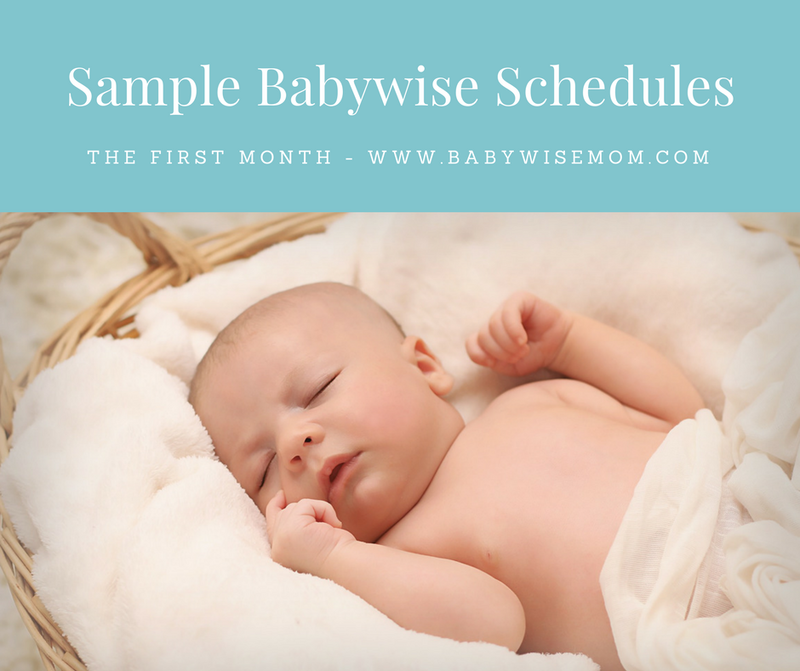 That said, we are desperate to find sample schedules so we can create one that works for us but we can't find one for a newborn. All the newborn ones seem to be with multiple kids (this is our first) or they are for 3 months and up. Any help out there??? Elizabeth, See this post: Sample Schedules : http://babywisemom.blogspot.com/2008/03/sample-schedules.htmlIt has samples of my different kids.For a week by week play, go through my "newborn summary" posts (click on the blog label) and you can see how the schedule changed weekly for my third. 10 – 13 week old boy7:30am – 8am – Feedwake time usually consists of baby in bouncy chair watching mom have her coffee.9:30am – Nap11am – Feedwake time consists of some sort of exercise for mom, either stroller ride or front carrier hike.12:30pm – Nap2pm – Feedwake time: bath then errands.3:30pm – Nap5pm – FeedWake time: bouncy chair or playpen time. Mom makes dinner.7pm – Nap or awake usually put in swing because tends to be fussy at this time.7:45-8:15pm – Last Feed Have not done dreamfeeds as we are usually in bed early and up early so found dreamfeeds would actually make me lose some of my sleep.3-4am – Feed (when baby wakes up) straight back to bed. Still trying to drop this feed. Hi Susana, My boy seems to be transitioning to longer time b/t feedings. He is now 13w+2 days old. Last night he went 8.5 hours b/t feedings (8:30pm – 5:00am) He has always gone right back to sleep, so this morning started with a 8:30am feed and he stayed up in his bouncy chair until 10:30am, i put him down for a nap and its now noon so i'm going to see if maybe going to a 3.5hr schedule works. Night time sleep is anywhere from 7 – 8.5 hours, we're getting there…. Angie:That is awesome! congratulations for doing all the work and now is paying off!my baby boy is going to be 12 weeks this next Monday!, and it doesn't look like he is ready to transition between feedings yet… but last night i added a dreamfeed, ate a full meal! and woke up at 3am, which is one hour later than usual!! and then woke up again at 6am his waking time, so yeah! a little bit of a change by himself!! so i guess i just gotta wait , be patient and see if he can STTN pretty soon like your baby boy! !thank you!! 8 1/2 month old (girl):7:00 wake and play in bed7:30 solids (plain yogurt and fruit or cereal and fruit) and bottle (6 oz)8:30-9:00 IP in playpen9:00-10:00 floor time with mommy10:00-12:00 nap12:00 wake, solids (vegetables and fruit) and bottle (6 oz)1:00-3:00 errands, playtime, and/or swimming3:00-5:00 wake, solids (vegetables and fruit) and bottle (4 oz)6:00-6:30 playtime6:30 bath and playtime with daddy7:15 bottle (8 oz)7:30 story and bedVal, I moved the naps back a little because she just doesn't seem tired after only 2 – 2 1/2 hours of wake time. But even now, she is playing in her crib for 30 minutes before falling asleep at the beginning of each nap. I am having to wake her to eat lunch and dinner, but I don't think I should push her naps back anymore…I mean she is already going 4 1/2 to 5 hours between meals during the day. Do you have any suggestions for other adjustments I should make? Thanks! And thanks for all the schedules; it really helps to see what other families are doing! S. Davis, how does she do when you put her down after two hours? Just wondering about your thoughts…my 3 week old is currently on a 3 hour schedule. I feed him approximately at 9,12,3,6,9 and then wake him at 11:30. Then he gets up like clockwork around 2:45 or 3am and then sometime between 6 and 6:30am. I can't get him to go any longer than those 3 hours between feeds in the middle of the night. I notice though that he is super sleepy and doesn't eat well, either at the 11:30 feed or the 3am feed. Would it be better to just stop waking him at 11:30 and let him go after the 9pm feed? And also, it normal for him to not sleep any longer than 2.5 hours in the middle of the night. I know he is super young still, but b/c he wakes at the same time every night I am concerned about him making a rut for himself. And I doubt how hungry he really is b/c he doesn't eat super well either. ejemama,It can be slight night/day confusion. I would feed her at 11 or just stick with 9. Good luck! Hi, I'm a mom of 8.5 month old B/G twins. They are awesome.Our schedule looks like this:5:30-6:00 a.m. wake, bottle (4oz)6:00 a.m. get dressed, play time in room7:00 a.m. breakfast 8:00 a.m. nap9:00 a.m. wake, change diapers, play time in room10:00 a.m. bottle(4oz)/lunch10:30 a.m. independent play time/blanket time11:00 a.m. jumpy seats, or walkers11:30 a.m. nap12:30-1:00 p.m. wake1:00 p.m. bottle (4 0z)2:00 p.m. free time, mommy time, walk (we change it up all the time what we do. usually we'll run errands at this time if we need to go out)4:00 p.m. cat nap, some days, they get pretty cranky if we don't take a nap, but they usually just talk in their cribs if i do put them down. (at least they rest a little, right? )5:00 p.m. Daddy home, dinner together5:30 p.m. Daddy gives baths, I clean dinner dishes, and get bed time bottles ready.5:45-6:00 p.m. Family play time in kids room while getting p.j's on6:00-6:30ish Bedtime9:00 p.m. Dream FeedThey will sleep all night, usually between 11 and 12 hours.Our schedule works for us. I just wonder if their naps should be longer? I'm lucky if I can get an hour of sleep during a nap from them. My girl sleeps better than my boy. They usually wake at 45 minutes and then fuss/cry/talk for the next 30-45 mintues. Should I just get them up at 45 mintues? It's not that I haven't tried for those 90 minute naps. We try ALL the time. They just rarely take them.And, I wonder if i still need a dream feed? i feel like maybe i do since they go to bed so early? But, i've tried to drop it and they are usually awake crying around midnight, and don't stop until fed, or they get up at 4:30 a.m. (not cool). so, for this reason, I keep the dream feed, which really isn't a big deal being so early.I guess my question is : Do I still make them take 90 minute naps? Or if the little guy wakes up after a 40 minute nap, and starts to cry and continues to fuss, do I just get him up. They are both always happy when I get them up.It's so hard to know what to do, isn't it? I wish I could just relax about it sometimes, but I'm always worried I should be doing something different!H. Hannah,Ideally they would have a longer nap. They might need to be up for only two hours before starting their nap.Their bedtime is not early compared to what time they wake up. So they could drop the dreamfeed if ready. Since they wake when you don't do it, however, I would say they need it.What you do when they wake early is up to you. If my child were crying, I think I would get them up. See my post on "waking early from naps/won't fall asleep for naps" for more ideas. Good luck! Hi I am a Mummy to a four years old toddler and 8 weeks old baby boy. I am trying to aim for a 8pm bedtime for my baby boy. I am wondering:(1) if his last nap ends at about 430pm / 5pm (I usually give him a feed at that time and he will wake up for it too), should he still take a catnap before the bedtime? (2) There have been cases where we put him down at 7pm or 7pm plus, he will wake up after a while – how do i prevent him from treating the bedtime as a catnap? It takes us hours to put him to sleep again.Thanks! Hello! I'm the momma of two 10 month old twin boys…who are in the 95th percentile for weight (at 24.3&24.7 pounds). I'm wondering when/how/if I need to drop a solid feeding around 1 year old. So far, our schedule is like this (I say like because my husband has his own agenda…ugh). 8:00 am. Wake, 6oz formula, cereal with fruit 8:30am. Nap 10:30 am. Wake, play 12:00pm. 6oz formula, veggies & meats 2:00pm. Nap 4:00pm. Wake, 6oz formula, veggies & meats 7:30pm. Bath time 8:00pm. 6oz formula, cereal & fruit (they eat a lot here!!) 8:30pm. Bed. I haven't really introduced snacking, I'm not quite sure how. And I'm afraid to cut that last feeding because they do eat a lot. I've read the sample schedules, and it seems as though I should give formula at 4, a snack at 530, and then dinner around 7? Does that make sense? Please help! Lily,Yes, I would do a catnap before bed.2-He might need a dreamfeed around 10 PM or so. I have 6.5 month twin girls.. they're schedule is this On a normal day lol..7-8 wake with cereal and 6 oz bottlePlaytime till nap at 111pm- lunch 1/2 jar each veg and fruit with 6 oz bottle Playtime then nap at 3 5pm- 6 oz bottle PlaytimeThen dinner at 8pm 1/2 jar each meats/veg and fruit 9pm- 7 oz bottle and bedtime.Does this sound right? Just wondering..
Greektwins11,You want solids three times a day. I would probably do solids at 8, solids at 12Then formula and solids at 4. Then if needed, a snack when you and your husband eat dinner. Then just formula at 8.And of course formula at 8 and noon. Thanks! I needed this today. I came on your website just to check out schedules since my 10 month old boy seems to be fighting his afternoon nap every day. This helped a lot. I notice a lot of people post that for the evenings they feed their baby ad then next is bedtime. Here is my question – are these babies falling asleep while eating, or are you feeding them and then putting them down? My little girl is 9 weeks old and her schedule which she has kind of fallen into herself is…Change to day clothes, change & feed: 0700 – play with after for a whileNap: 0830 – 1130Wake, change & feed: 1200 – play afterNap: 1400 – 1600 ishWake, change & feed: 1700 – play afterNap: 1830 – 2030Bath: 2030Change into PJ's & feed: 2100 – read to afterNap: 2330 – 0100Try to 'Dream Feed' at 0100Sleep till 0700She has quite bad nightmares so her 'nap time' is disturbed sometimes with this. The first trick is to figure out why he is waking. I have a post called "5-8 month sleep disruptions" that can give you a list of common reasons for this in this age range. I also have a post called "nighttime sleep issues revised and updated" that can give you some guidance.Think back to what has changed since he started and stopped STTN. If he is waking hungry, then it is likely a growth spurt and you either need to just wait until the growth spurt is over and he will sleep through on his own again or try to feed him more in the day (either more at meals or more often). If you are breastfeeding, be sure your milk supply is good. Good luck! Schedule for our almost 11-month-old who has been on a structured routine since day one. I think we are beginning the slide toward one nap, but are not there yet. She has always been bottle fed.7:00 = Up for the day, sip on a bit of water, change diaper. Play for a bit if breakfast isn't ready yet.7:15ish = Breakfast! Followed by play time. There is usually a morning snack around 9:00, something small, like some fruit.9:45 = Bottle. Then finish playing and get prepped for a nap (clean diaper, sleep sack, white noise, books. )10:15-noon = Sleep and a diaper change upon waking.12:15ish = Lunch! Then lots of playtime.2:ooish = Afternoon snack! Depending how much she ate at lunch, this might be small (some fruit and cheese) or big (veggies, pasta, etc.) More playing.3:00 = Bottle. Then finish playing and get ready for a nap.3:30-4:30ish = Nap. I say "ish" because she has been playing in her crib for 15-20 minutes at the start of this nap, and once she falls asleep, I try to let her sleep for an hour.Diaper change upon waking.5:00 = Small snack6:30 or 7:00 = Dinner7:30 = Bath, bottle, pajamas, books, bed. She goes into the crib at about 7:50 and is asleep by 8:00. Again, she plays around in the crib a bit before sleeping. 6 month old girl…6:00 am feed and back down to sleep (working on extending her nights!) 8:00 am nurse and solids. Usually about 2 T cereal and 3-4 T fruit9:05 am Nap11:00 am nurse with solids. Usually 2 T cereal and 4 T vegetable. 12:30 pm nap2:45 pm nurse4:15 pm nap5:30 pm wake6:30 solids. Usually 2T cereal and 4 T vegetable7:00 nurse and to bed for the nightOur schedule is a little weird at the end of the day because she's not ready to eat when she wakes up from her last nap, so we wait and do solids first and nap at bedtime. I'm hoping we will drop that 6 am feeding soon! I Al's think she's ready to be on a four hour eating schedule, but we need to get her naps and wake time to comply! Our baby boy will be 14 weeks old tomorrow. Delivered nine days past due date. He's been pretty good to us!Our routine on a perfect day…can often fluctuate 15-30mins depending on what we are doing for the day.6:30-7:00 wake/diaper change/eat then play9:00-10:00 nap10:00 wake/eat/etc12:00-1:00 nap1:00 wake/eat/etc3:00 nap4:00 wake/eat/etc5:30ish nap6:30 wake/eat/family time/bath every other day8:30 eat and STTN (except recently, waking briefly 4-5am – he's been breaking out of his swaddle)I've been tweaking our evening routine over the past couple of weeks and this is what I think is working best for us. We cut out the fifth nap that BW recommends, still kinda trying to figure it out though, not sure if its possible causing the nighttime waking. 7mo 3 week girl8a- wake, bottle (8oz), diaper, play9:30- nap11a- up, diaper, play12p- bottle, solids (not much, doesn't like solids much so far)1p- nap3p- up, diaper, play4p- bottle5p- nap6p- up, diaper, bottle, solids with family at dinner7:30p- start bedtime routine, PJ's, bottle, story, bed by 8p.Question- sometimes it's hard to get a 2 hour nap from her. My mother is convinced she should have longer wake times and only two 1hr to 1.5hr naps. She thinks a baby that age should be able to be up 3-4 hours between naps. I was considering going to 2 naps, but scared how she might handle that if she doesn't lengthen her naps. It seems her first cycle and last cycle of the day she can get really cranky if she has to go more than 2 hours awake. Is my schedule too "young" for her? Thank you so much for your blog!My girl is on a 3hrs10-schedule. She can stay awake for about 1h40mins and usually sleeps for 1.5h. In the morning she could go longer in between the first and second feed, I guess because the milk is more filling in the morning. I tried 3.30 and 3.45h, no problem. If I wait until she says she's hungry, she even goes up to 4 hours and more. The rest of the day I think 3.15 is best for her.But because she can't really stay awake longer than 1h40mins and I don't think she would sleep more than 1.5h, I have to feed her at 3hrs10mins, if I want to keep the eat-wake-sleep order, although she's not really hungry then and risk that she doesn't eat properly…What would you recommend? Hard to say exactly without her age. I would say let her go 4 hours in the morning and then just go as long as she can the rest of the day. She will naturally get longer as she can sleep longer. 11 week boyWe just increased his wake time and it has really helped the 45 minute intruder. That being said, it's not quite solidified yet.7:00 wake and eat8:15 nap9:45 wake and eat11:15 nap12:45 wake and eat2:15 nap4:00 wake and eat6:00 bedtime1-2 MOTN feedsThe last wake time is a bit too long, so I let him sleep longer to help shift things at the end of the day. A nap after 4 results in lots of wakings early evening. 3.5 Month Old(Breast milk only, goes to daycare on weekdays)7:00am – Wake, eat (BF)8:45am – Nap10:15am – Eat (bottle, 5oz)11:45am – Nap1:30pm – Eat (bottle, 5oz)3:00pm – Nap4:30pm – Eat(bottle, 5.5oz)6:00pm – Nap7:15pm – Bath, lotion, story7:30pm – Eat (BF)8:00pm – Bedtime11:30pm – Night feeding (BF)My boy is a short napper, so he doesn't always make it until the next eating time. I try not to stress too much over it because daycare does a great job of making sure he has waketime after he eats, letting him fall asleep on his own, and keeping to the schedule. The night feeding is sort of a dreamfeed in the sense that he doesn't really wake up and goes immediately back to sleep, but he eats a full meal, so I still consider it part of his caloric needs. I am still doing it for three reasons: 1) to maintain my supply, 2) because he's on a six-feed schedule and his daytime schedule works very well right now, and 3) honestly, it's a quiet bonding time and I'm not ready to give it up! I will probably move from 6 to 5 feeds/day in a month or so, by dropping the night feed, prior to the introduction of solid foods. Hi, my little one is 4 months old and I chanced upon baby wise late. We are starting to put him on a schedule but I find that it's almost impossible to keep to it without varying it too much from the 30 mins window as his nap and bedtime is very closely linked to his wake time. For eg. His ideal schedule would be wake 7.30am feed play and down for nap at 9pm as his first nap usually takes place 1.5 hrs after he wakes. However, sometimes he doesn't go down till 9.30am and that throws the following schedule off. At the same time, baby wise says to keep feeding to 3 hrly till he sleeps through the night which hasn't happened but I find that with his 2 hr wake time before nap and 2 hr nap time, it's usually 4 hrs before he gets his next feed. I wonder if that could be a reason why he can't sttn. Would love some advice. Do I keep to a fix time for each activity and nap per day or do I let his wake time after naps dictate the schedule? Currently his wake time of 2 hr after each nap is the deciding factor for the next nap but it doesn't seem to be working so great especially if we are out, he gets thrown and he wouldn't sleep almost the whole night when his bedtime crosses 9pm. Thanks. I would work on being more consistent. It is okay to have a day every so often that is off, but you will want to have more consistency day to day to get sleep regulated. If he is doing fine in the day with a four hour schedule, though, I would personally keep that going. Hi I have a 4 mos old girl. Her scheduled is mostly based on 3 hour feeding and her optimal wake times.7am – 4 oz bottle (she can only finish this much. Wake time give or take 15 mins if it changes)8:40am – nap10:30 am – bottle (i used to do 3 hours but noticed she never finishes her milk)11:40am – nap1:30pm – bottle (sometimes she doesn't finish this one either)3:00pm – nap4:30pm – bottle6:10pm – nap7:10pm – wake her7:30pm – bath7:45pm – bottle8:00pm – sleep11-12 – dream feed3am/4am – she wakes up and we feed her.We can't seem to get rid of the 3/4am feeding. I don't think she drinks enough which is why we still feed her at this time though. She just isn't able to finish more than 4oz. I almost always have to wake her up after each nap for feeding. And if I'm late it throws off her last nap and the rest of our evening. We really want her down by 8 so that we could have some time of our own. I tried removing the 4th nap but she gets so tired and I feel bad. If I move her bed time earlier she might wake up at 2/3am and we don't want that. 🙁 Please help. Thank you. 8 Month Old Boy7:00am Wake, Bottle, Solids9:00-11:00am Nap11:00am Wake, Bottle, Solids12:30/1:00-3/3:30pm Nap 3:30pm Wake, Bottle5:30pm Solids 6:30pm Bottle7:00pm Bed- His solid feelings are at the same time as our meals.- The start and end times of the second nap are dependent on how well of a first nap he takes. If he wakes early from the first nap I will put him down at 12:30 for the second nap. Jami RayfieldMay 3, 2017 at 12:25 AMI have an 8 week old and a toddler. My toddler sleeps from 8pm to 8am. The baby always wakes up at 8 am as well. 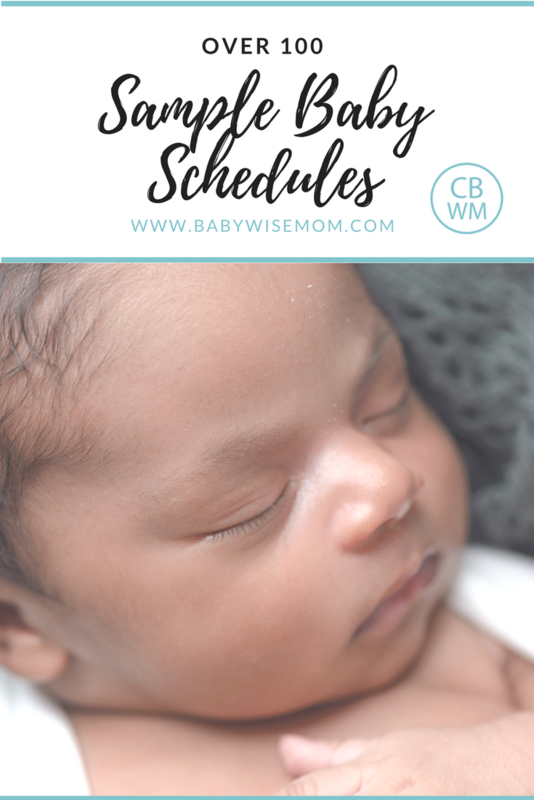 I want the baby to work towards the same schedule as my toddler, But I can't seem to figure out which of allllll the schedules to use?! And I'm too tired to figure it out. Help?! Almost 3 months I wake him up at 9:00 am-breast feedGo down for nap 10:00 Breast Feed 12:00 Go down for Nap 1:00-1:10Breast Feed 3:30 Go down for Nap 4:30Breast feed 6:00 Go down for Nap 7-730 Formula bottle 8:00Goes to sleep 9:00 Dreamfeed 930-10:00He sometimes awakes by the 45 minute intruder during 2nd and 3rd nap but if I go in right away and give paci he goes right back to sleep and finishes out nap… he started sttn at 7 weeks! 3 months6:30 eat7:40 nap9:30 eat10:50 nap12:30 eat2:00 nap3:30 eat5:00 nap5:30-6:00 wake for the evening7:00 eat7:30 bedtimeStart time and bedtime are very consistent from day to day, feedings are "on time" about 90% of the time. Waketime and naps are more variable from day to day. Some days she hibernates, other days she seems able to be awake and alert more, so we rely on cues quite a bit for naps. Occasionally chaos ensues and every nap is off! But we are close to the schedule most of the time- I include that info to encourage anyone reading who sees these schedules and wonders what they are doing wrong on off days- I've been there! Bad naps and bad days happen, but they have gotten much less frequent. STTN the full 11 hours most nights, she would occasionally starting around 9 weeks but now she is eating more at each feeding and she has started making it through most of the time. Dreamfeed didn't work for us (we gave it a good effort, but she woke earlier with the dreamfeed than without) and cluster stopped working around 8 weeks. Hi! Thank you very much for doing this, it is so helpful. Can you please estimate the babywise schedule for 5 month old formula fed boy Alexander 6,3 kilo (13,9 pounds). Thank you very much!